I was craving some kabob type of food but wanted something different from the normal. Since I had a few pounds of ground beef I decided to go for some meatball type of a dish. 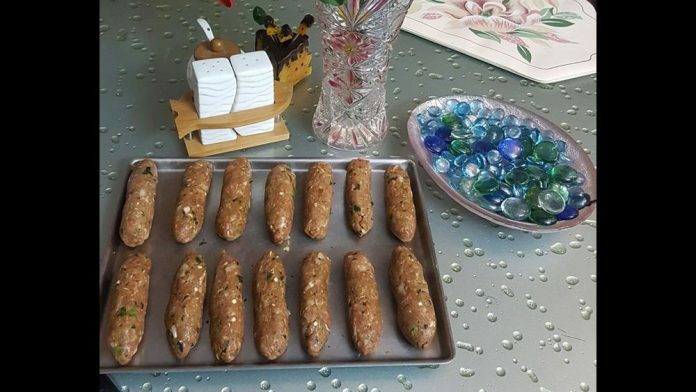 I found this recipe for kofta…kefta or kefteh. I guess it is pronounced differently in the different regions. I found this recipe to be pretty easy to prepare and execute. Well, at the end of it…this is really a hamburger shaped like a hotdog. 1. Add all the ingredients together and mix well. 2. Give a round shape shapes (like balls), refrigerate for 3 hours. 3. Take out the mixture and put the meat on a bamboo stick. 4. Press it into the stick and shape it like a hotdog but smaller. Use some oil on your hands to prevent it from sticking to your hands. 5. Grill / bake or shallow fry them until done…since it’s ground…you want the internal temperature to reach at least 160 degrees. Serve immediately. Enjoy with tomato sauce or a yogurt sauce. If you like spicy food you may increase the amount of red chili powder. You also don’t have to use skewers. They hold a shape really well from the egg.